Okay, so this might be TMI (too much information) ! 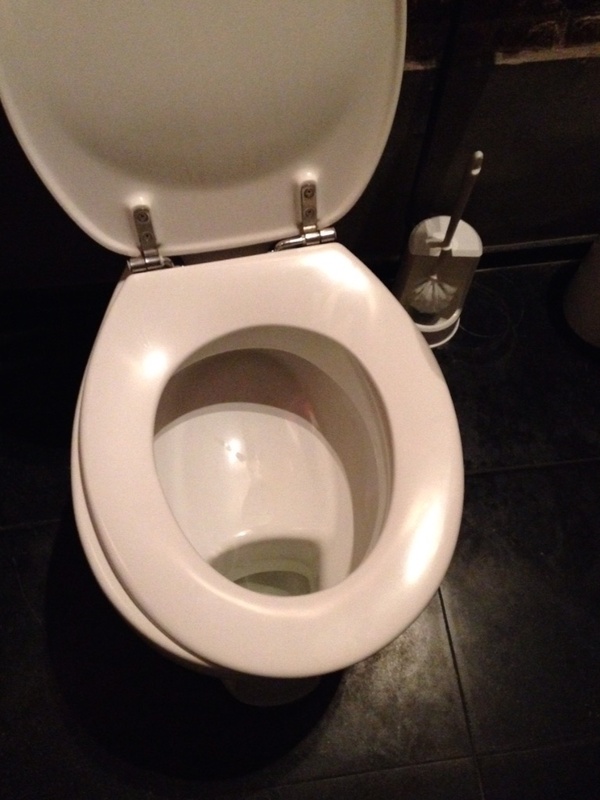 I know, I know, it's a bit unusual to do a post on toilets. Because they're all pretty much the same, right? But there was a lot of culture shock regarding toilets here - at least for me. Toiletten (they aren't called bathrooms here, that's only for bathing) are different here. And let me start with what's good about different. Public toilets are immaculate!!! 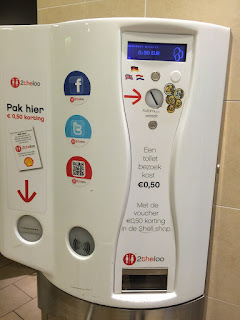 You typically have to pay to use one (50 cents or so, collected by a nice woman holding a little plate or else a machine). But so worth it, because they're sparkling clean and smell nice. And if for some reason they don't meet your cleanliness requirements, there is always a dispenser of cleaning solution located on the wall, so you can freshen it up a bit if you want to. 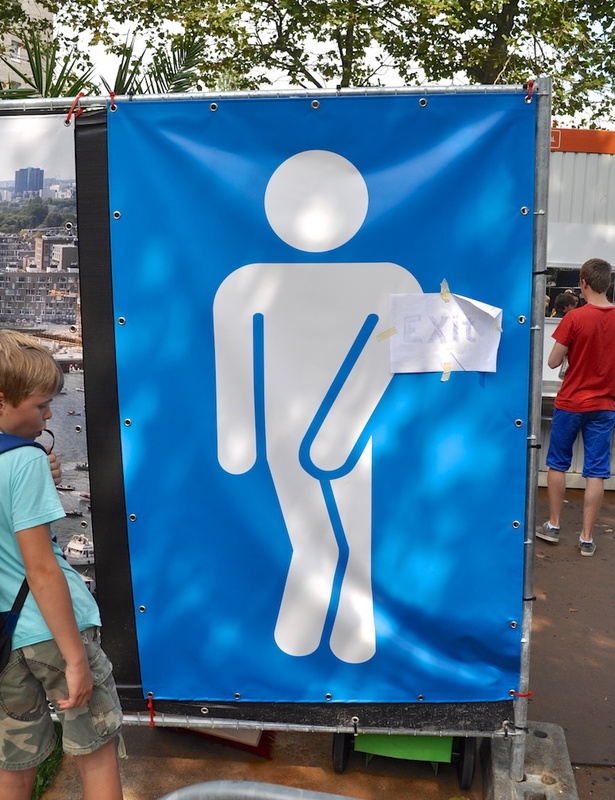 But, there is another side to public toilets for men - public urinals. They are everywhere around the city. And totally exposed. 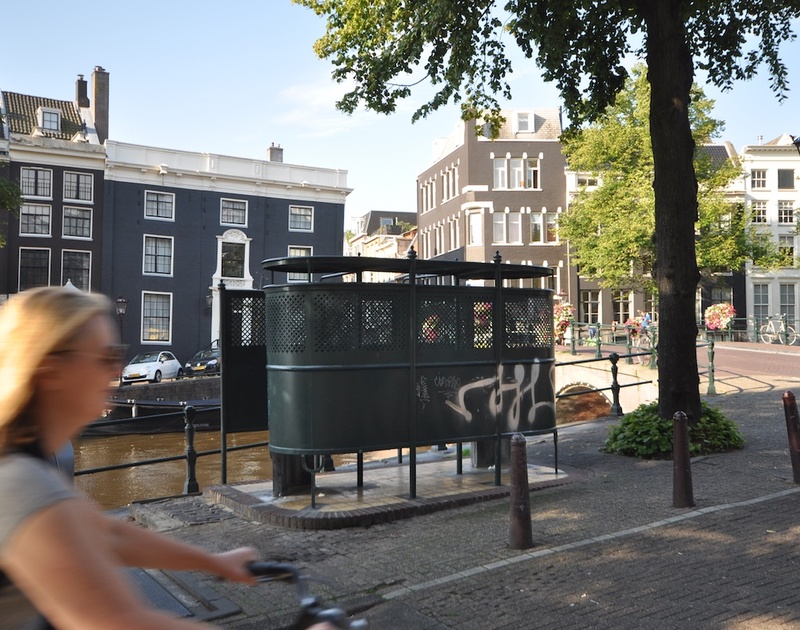 Yup - that's a urinal in the middle of the street, next to the canal. 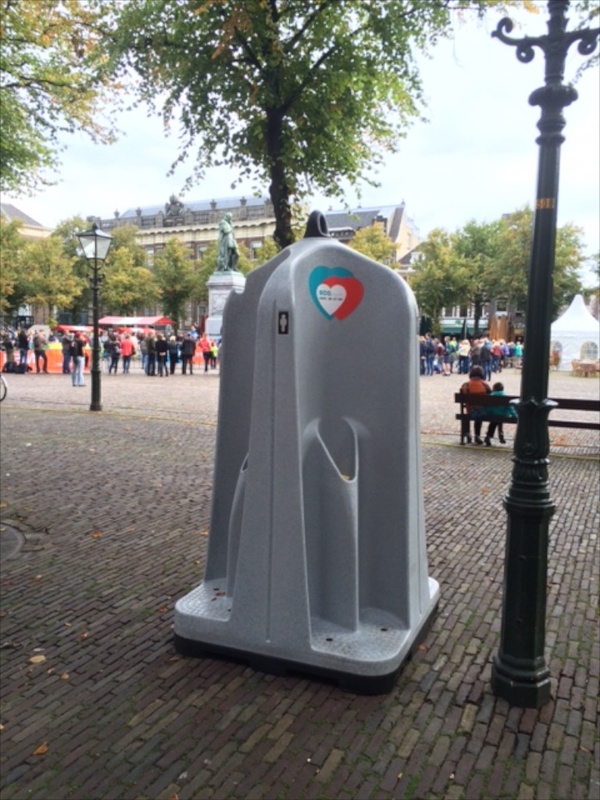 The more modern ones are circular so they can be used by several men at once - see this one right in a square? And men just saunter right up and use them. I find this really, really odd. But it's totally accepted here. And Dutch toilets are also a bit unusual (At least the older ones - new ones seem to be following a style like we have in the US). You see, they have a flat shelf area at the bottom of the bowl. And well, how do I put this delicately, that shelf holds solids, uncovered by water. Why? I have no idea. But it does present a cleaning challenge. Which is probably why every Dutch bathroom has a toilet brush next to it, as you see here. toilet is a tiny, tiny room. Once you get in there and close the door, you realize that it's tough to do what you need to. Sitting on the toilet is similar to squeezing into an airline economy seat - your knees will often be right against the wall in front of you. This means the sinks are also tiny, sometimes it seems like you can only wash one hand at a time. And only with cold water - the Dutch are thrifty and see no need for hot water in the toilet! I know none of this stuff is likely to show up in a guidebook about the Netherlands. 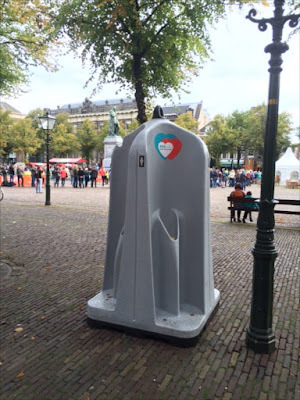 And don't get me started on the new trend in other European countries that involve no toilet seat at all :-) In that case, I'll take the Dutch models! So they have those circular public toilets but shorts are NOT acceptable to wear in public? Go figure. Every time I have ever travelled abroad I always reach the same two conclusions. The United States has the best plumbing in the world!!!! And, McDonald's exists so that there are decent bathrooms to use when traveling abroad. Cheers! Wow. Interesting and eye-opening post. I'm not sure what to think about the men urinating outside. I suppose it's similar to going behind a tree? But in public, which is weird, yes. Thanks for the "different" post. Dare I say I enjoyed it? Seems like it's worth the wait to me. I don't even like port a potties! It is similar in Germany, and open seats are common, even in homes. I had two WC (water closets) in my home, around the corner and down half a flight of stairs (both were in the stairwell) from the bath. Like a lot of German homes, it was originally built to house two apartments on top of each other, connected by the stairwell, but usually the toilets are in the apartment, not in the stairwell as this was. 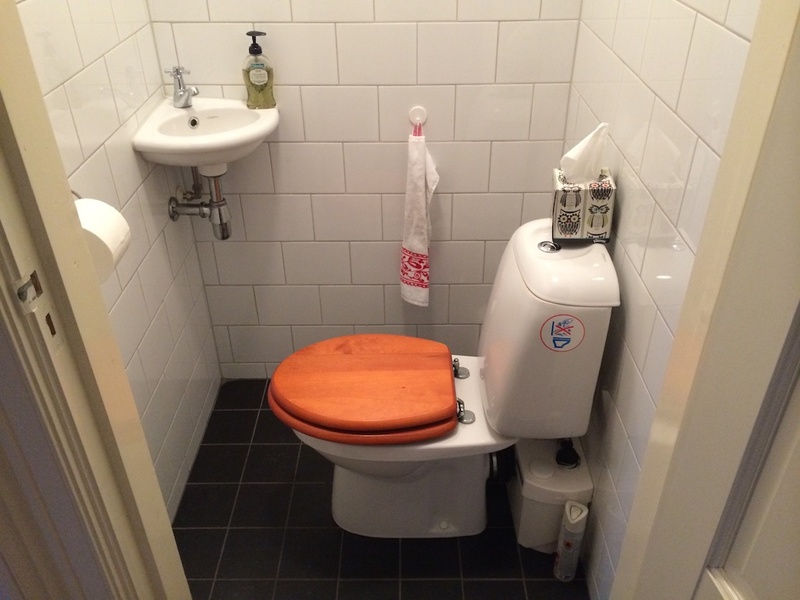 It is also typical for German houses to have a WC near the front door because laws say you can knock on anyone's door and ask to use the toilet. I'm not sure if this is still the case, and I never tried it, but many homes built or renovated after WWII include this feature. I had one of the shelf type toilets too, and I was told the design originated when tapeworms and other problems were common, and it does make getting a stool sample easier. Europeans tend to be less squeamish about such things than Americans, and many old health manuals talk a great deal about digestive health being key to general health. I never had trouble finding a toilet in Germany--it is acceptable to go into most any bar or restaurant or public place, like a church which are open most of the time, to use the facilities, and not all of them charge. It is nice to stop for a drink or make a donation when you do though. I had a friend who was afraid of toilets outside her house, but when I showed her how clean most German facilities are and that cleaning solution and a brush is normally readily available, she started to travel more with me. Bring your own wipes (don't flush them) and TP if you are the squeamish type! European TP is usually brown and scratchy and made from recycled paper, at least in public bathrooms. It is OK, but some Americans don't like it. 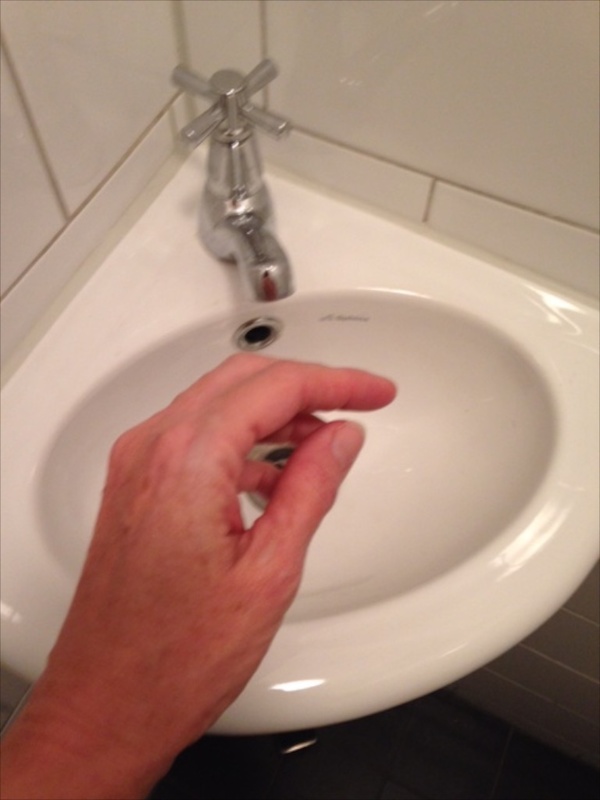 Cold water taps only are very common and make perfect sense to me. 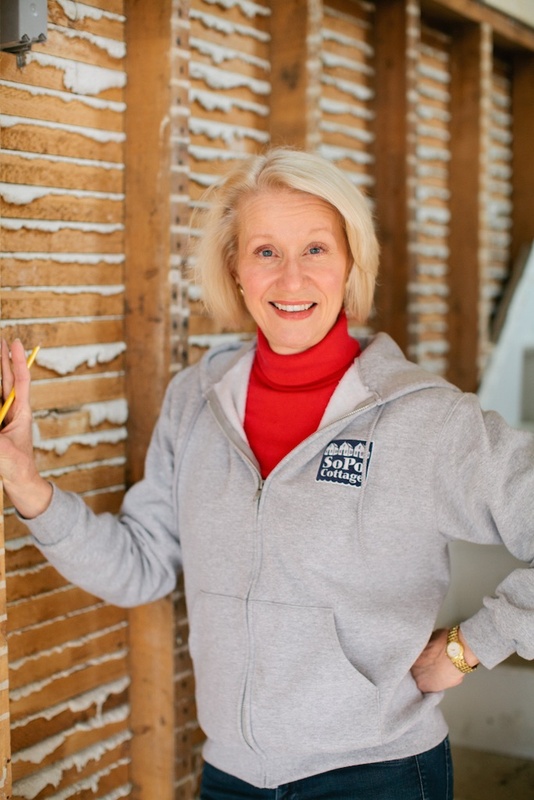 We waste a lot of water waiting for the hot water to start from a tank--on demand tanks or small water tanks for each bath are common, but typically don't serve the whole house unless you have a newer integrated system. So it is really expensive to have hot water at every tap, especially with a separate toilet and bath. I think the whole system makes total sense and allows use of the toilet when someone is bathing. I was fortunate that my WCs were small completely tiled rooms, with tiny corner sinks and windows, and separate heaters, but not knee knockers! It is so much more hygienic too to have the toilet separate from where you brush your teeth, especially with an open seat. And open seats encourage frequent brushing! I don't have a link, but public urination, esp. by popular pubs districts, is so common in some places in Germany that they came up with a special paint that splashes the urinator to discourage the practice, with a warning sign. In a country that is so clean, it seemed odd that it was common to see little children and men use the park bushes and trees, mostly to urinate, but I suppose it isn't worse than a dog lifing a leg. In fact, little signs showing a dog squatting with a NO! on it is a fairly common sight on tiny front lawns. I brought one home, but my husband thinks it is too rude to put outside. Wow - thanks for all the insights Kathy. I can't imagine having someone knocking on my front door and asking to use the WC. What a fascinating law! I think it came from the days after WWII when so much of Germany was in ruins and functioning toilets were rarer, and the law stayed on the books for awhile. People forget what a mess Europe was after the war and food rationing and displacement camps were the norm for quite a while and the occupation lasted about 10 years, and rebuilding housing and the economy lasted well into the 1960s/ The rebuilding part still continues for some landmarks and some areas never really recovered, especially the Meuse Argonne in France, hit hard by both wars. The US felt the effects too, and the manufacturing took some time to retool--didn't really do it until the early 50s and after the Korean War. Culture Shock - "It's Not Possible"